➷Crafted with high density water repellent and tear resistant nylon fabric protect your belongings from light rain, accidental water spills and crash bumps, neat work and durable materials is a guarantee for the backpack can stand up for years of use. ➷Metal frame and thick foam provide ultimate security for carryings, keep the backpack in original shape and easy access condition. ➷Built-in USB charging port offer a quick charge for your phone without opening up you backpack on the go. ➷Spacious main compartment offers roomy and safety space for your 15.6" laptop/tablet/ipad, also there's lots of scientific practical pockets inside make your belongings and frequency need items well organized and easier to find. ➷Roomy back security pocket for valuable and private accessories from thief or damaged by other stuff. ➷Easy access wide opening compartment is convenient for daily use, especially for items use in a hurry or frequency. ➷Broad adjustable shoulder straps, high grade metal zippers, reinforced handle and durable lining are neat work to provide comfortable and easier carrying experience. ➷Perfect gift for teenager and adult, suitable for men and women as well A multi-use laptop backpack suitable for travel, school, work, business trip and casual daily use. ✎PREMIUM MATERIALS: Nylon/ PU Leather, water Resistant and durable; Dimensions: 16" x 11.5" x 7"; Weight: 1.82 LBS. ✎ USB CHARGING PORT DESIGN : With USB charger outside and built-in charging cable inside, this backpack offers a convenient way to charge your cell phone with a power bank, free your hand while walking. Pls note the power bank is not included in the product package. ✎EXQIUSITE WORKMENSHIP: Simple and practical design perfect fit for boys, girls, teens and adults, Reinforced edges and steel frame keep the perfect shape of the bag and Ensure a secure & long-lasting usage everyday & weekend. Ultra durable metal zippers and shoulder straps for comfort carrying. 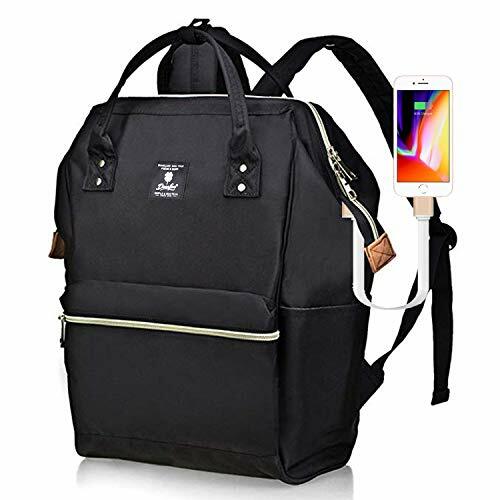 ✎MULTI-USE BAG: Fashion and unique design for all age, this USB charging port laptop backpack is a multipurpose bag fit for school/work/business/travelling, also it's a ideal casual backpack for daily life, a perfect birthday and Christmas gift for men and women. If you have any questions about this product by DEARFUN, contact us by completing and submitting the form below. If you are looking for a specif part number, please include it with your message. Laptop Backpack, Business Travel Computer Bag Anti Theft Waterproof Backpack with USB Charging Port & Headphone Interface for College School Women and Men Fits for 15.6 Inch Laptop-Black.